Bold Women — NAN CRAWFORD & Co.
Nan was a true partner in helping me develop my story in ways that brought partners and significant funding on board. "The pinnacle of our work together was my participation in the Clinton Global Initiative. We didn’t have funding yet, potential partners were in the audience, and Chelsea Clinton was going to highlight our WeTech project. I had 1½ minutes to talk from the floor and make it happen. I was nervous. I took a breath and remembered how Nan helped me hone the content and connect to the confidence I needed. It all landed. Four months later, I was on stage with Hillary Clinton. We had raised $4 million." Author of animated documentaries:The Story of Stuff, The Story of Cap and Trade, and The Story of Bottled Water. The Story of Stuff exposes the connections between environmental and social issues. The film and the book are a call to arms to create a more sustainable and just world! When the book was coming out, Annie worked with Nan to prepare for her appearance on The Colbert Report. 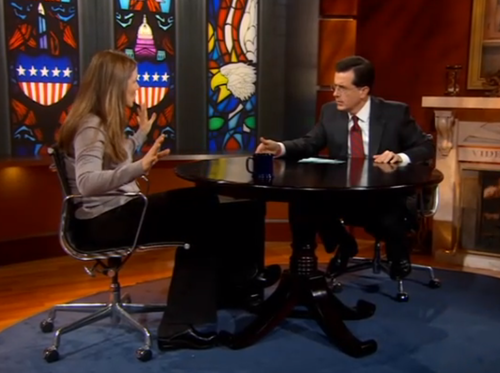 "'I wanted to do anything else but appear on The Colbert Report. Nan looked me straight in the eye and said 'You can do this. I'll be in your corner'. She prepared me and gave me the tools to succeed!" I enjoy public speaking and have a lot of experience but with support from a pro like Nan you can hit it out of the park. She prepared me to address almost 7,000 attendees at the Watermark Conference for Women. Nan’s help in framing the content and fine-tuning my delivery were behind the positive feedback I got. So many people told me how inspiring I was. Public speaking is like any skill, you need to practice and take lessons. Nan is a great coach. My advice: put yourself in the hands of this pro. “Finance is dry, very dry,” notes Rita Lee of Brouwer Janachowski, a boutique financial advisory firm. “I do quite a bit of speaking but have never felt at ease with public speaking. My goal working with Nan was to change that. We totally succeeded. Today I’m a story teller, I know how to draw in my audience. The content is still finance, I’m still talking about what to buy and what to sell but now I know when to pause, what stories to weave in, how to emphasize my message with body language. When I get on stage I feel good. People really hear what I say. Nan has become my partner. She really knows her stuff. She asks me questions that pinpoint my needs before I even tell her. The investment of time has been invaluable. Whether I’m speaking to hundreds of people at industry conferences or small groups of girls I mentor, Nan has helped me nail it. And, now I actually enjoy it. A leading women’s activist, author and speaker on leadership, politics, reproductive and public health and media, Gloria appears on major national radio and TV programs. It was so useful to have the opportunity to download what had been swirling in my mind for this presentation. It’s very calming. Nan is extraordinarily skilled at getting the heart of the question. I don’t need to worry. I feel very confident. 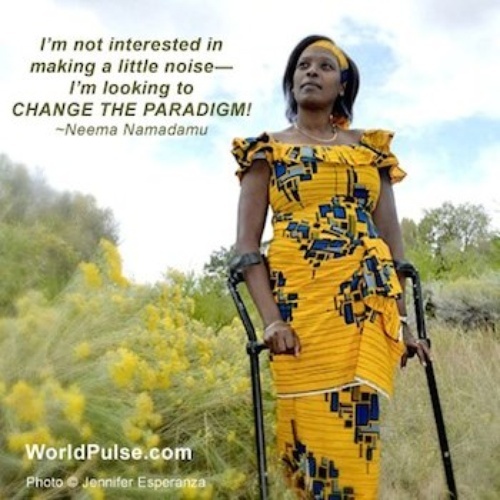 When Nan and Neema Namadamu met for the first time, Neema was about to appear on CNN, and present to the State Department, but she had never given a speech in English. Neema runs a non-profit group in the Congo helping women and girls access health care, clean water, education and equal rights. "In the short time I had with Nan, I learned how to craft and communicate my passion. Since then I have spoken at events around the world, from Women in the World to UNESCO. Nan is incredibly encouraging and clear. When she talks, her movements and expressions convey her words. I became confident. I no longer felt limited by my English. Nan led me to choosing words that were familiar but powerful. And to deliver them with my eyes, my face, my hands, all of me. Nan helped me become an engaging speaker in English. She has the gift to help everyone". Kim-Hien contacted Nan to help her with her speaking skills, her confidence on stage, and in particular to prepare for a technical presentation to a large high-ranking engineering group. “I felt that I had so much work to do to be a confident speaker.... and we had time for just one session before my first presentation. I was worried I couldn’t pull it off. Little did I know that the "working brief case" Nan had given me was full of simple gifts of great strategies. My mind was subconsciously weaving all those coaching strategies into the presentation. Every time fear knocked on my door I heard Nan’s voice reaffirming - that I have what it takes to overcome my fears. I stepped off stage knowing the energy in the room was strong, participants were curious and engaged. I could see their heads nodding as I moved though the presentation. They asked thoughtful questions. They wanted more product information. They complimented me on the story I was able to weave. Before I met Nan I did not think that I could make an engineering topic delicious, and enticing. I did not know how to connect with an audience around a great idea. Now I know it can be done and better I know how to do it. Imagine yourself, 11th grade, standing in front of 10,000 people in a Las Vegas Conference Hall. That was how Anna Nixon was putting the lessons Nan taught her into practice. Autodesk, impressed by Anna's work, invited her to speak at XSummit, their annual Design and Experience Conference. “The closest experience I had to XSummit, was high school debate club where we presented to maybe 10 people. And I didn’t feel I was very good at it! Daunting doesn’t even close to what I was thinking when Nan took me in hand. Once we’d finished my speech was clear, to the point, conversational and easy to follow. She taught me a strategy – to tag each paragraph with a key word identifying its purpose and the impact I want to have. Super effective. She helped me to vary my tone and modulate my voice. So impactful. People now say, you looked so comfortable on stage – but I wasn’t necessarily comfortable. After XSummit, I was invited to Autodesk University Conference as part of the CEO's keynote in front of 10,000 people, on a huge stage. I focused on what Nan had taught me. And I did really well. From there I was invited to speak at a conference organized by Audi in Germany ! Nan is my speech mentor. I feel her at my shoulder every time I give a speech. I try to share what she taught. This summer I coached our intern group to give an awesome presentation to company executives.What Nan and I achieved together comes to me every time I stand up to speak. View video of Anna's TEDx speech. • Nan worked with the youngest partner in a leading consulting firm to help him become more confident and assert more of his initiatives internally. She helped him build relationships with CEOs of major foundations and President Obama’s Secretary of Education. • Engaged by a technology industry leader to coach a team on communications, relationship building and leadership skills. Within a year all team members had been promoted. • Coached two VPs for a major Entertainment Industry client, on how to increase their presence and influence at high-stakes meetings with the CEO and divisional presidents. Following the engagement, both were promoted to Executive Vice President positions for their divisions. • Coached the founder of a social venture for a prestigious TED talk. Nan elicited pivotal stories and co-wrote the speech. Following the speech, one of the conference organizers said, “You’ve raised the bar for TED talks.” Nan has since coached numerous presenters for TEDx talks. • Nan has coached women leaders from Columbia, Bolivia, India, Democratic Republic of Congo, The Philippines, Tibet, Uganda and the U.S. to present at the State Department and The Clinton Global Initiative. • Coached several executive directors of non-profit organizations to build stronger staff relationships, lead high-impact conversations with Boards of Directors, and prepare for funding pitches that have raised millions of dollars.